We are going to Veradero for a one week in January. It will be our third time to Cuba. We went once BB [before baby], to Jibicoa. This trip included two daytrips to Havana. Love Havana! Our second trip, with child, was to Cayo Coco. We did one long daytrip to Trinidad from there. This time it is the touristy mecca of Cuba: Varadero. While we are independent travellers at heart, we have yet to do anything other than the all-inclusive there, with a few light forays, out and about. Nonetheless, I will enjoy journalling our experiences of r-and-r'ing with our 3 year old, in the new year. In the meantime, it's fun to do a little armchair travel. What follows are some links with tips and travel stories about travelling in Cuba with kids. 1. 6 Fun Things to do with Kids in Cuba Scroll to the bottom for a list of 6 kids books on Cuba. 2. 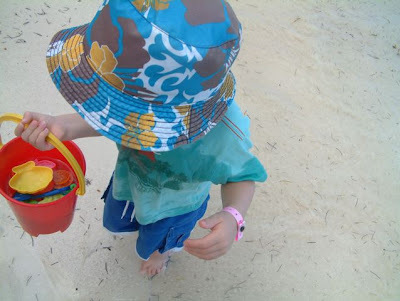 Family backpacks Cuba with 2 year-old "Despite it being a challenging holiday, principally due to our new status as a family, Cuba was exactly what the psychotherapist ordered in terms of a plausible adventure for all of us." 3. Travelling Cuba en Famille "If you want more than a beach holiday, Cuba with young children needs careful planning. Compromise is the key: beach time for them, sightseeing for you"
4. Preparing for Cuba with kids and Parental Leave "Cuba seems a perfect destination for travel with kids: no rampant tropical diseases, a great health system, a reputation for being family-oriented ..."
5. Tips Avoiding All-inclusives Travelling Cuba with Kids "... stay in casas particulares (private houses that rent out rooms and usually provide meals"
6. Keeping kids busy on overcast resort days "Sketching local flora was one way to occupy a six-year-old, who had his heart set on building sand castles, in windy Cuban weather"
The beach in Varadero is fantastic and the little town is cute. There's actually quite a lovely little park in the middle of town. Don't sweat the all-inclusive - we're tired of it so we'll likely try somewhere else for our next holiday but you can't beat the convenience when you're with a kiddie. I love the idea of a casa particular but there are none on the beach in Cuba and we are tried & true beach lovers - if we're heading down South, we have to be on a beach! Ah yes, I know what you mean about loving the beach. When the beach is good, I could easily spend half or more of vacation there. And Cuba's beaches are simply paradise. I look forward to checking out Varadero and thanks for the tip on the little park in the middle of the town.